Long before the subject brewery coexisted with a hotel, the Brunswick Street premises were known as the Castle Tavern and – according to an 1816 entry in the licensed victuallers’ records – its first licensee was Joseph Baker; it would thereafter be listed as the Castle Inn, Castle Hotel and, eventually, Castle Hotel & Brewery – addressed as 85, Brunswick Street. In 1822 Joseph Baker was superseded by William Herbert but when Herbert retired in 1832 Joseph Baker reverted to being the licensee. 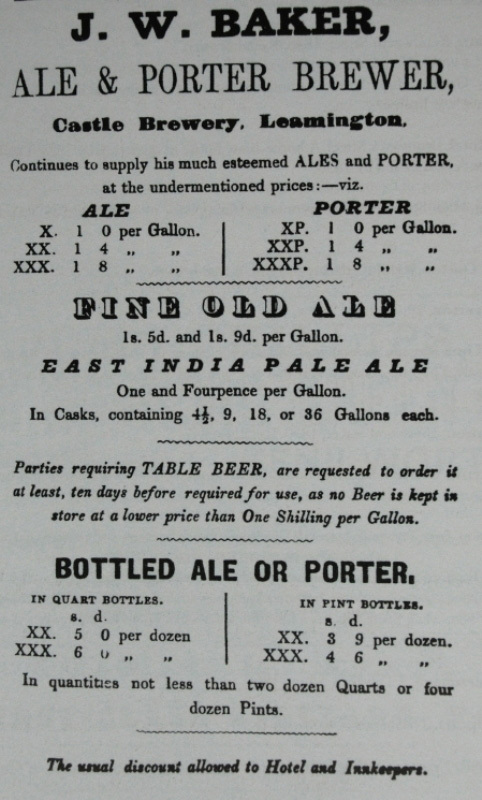 It has not been established what Baker’s involvement was for the 10 years post 1822 but as the first proprietor of the Castle Brewery would be Joseph Baker – operating it on the same premises as, and in parallel with, the Castle Hotel – this break in his tenure indicates that the brewery was yet to commence wholesale operations. Although an 1832 ‘To Let’ notice reveals that the Castle Hotel had its own brew house there is still no evidence to suggest that its brewing volume was any more than sufficient to fulfil its in-house requirements, and maybe support a ‘bottle and jug’ trade. When Joseph Baker died in 1840 the licence was transferred to Sarah Baker – executrix of the deceased – until Joseph’s son took over in March 1844. 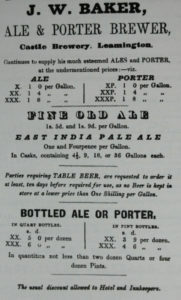 When John William Baker did take over the business the press statement announcing his ‘arrival’ contained the earliest evidence that the Castle Hotel was also supplying its Ales and Porter to external customers, and not just its own patrons – but there would be no sign of any Castle Brewery press advertising until December 1845, when it became evident that Baker had commenced wholesaling his products. Then – a little more than 3 years after announcing his ‘arrival’ – John William Baker died in May 1847; he was just 28 years of age. With the expiration of the lease imminent – or having already expired – the Castle Hotel was advertised ‘To Be Let’ in June 1847, and in the December the household furniture, effects, brewing and stabling equipment were auctioned on the instructions of the deceased’s executors. It appears that the freeholder [name unknown] retained ownership of the premises in the long term – as I haven’t sighted any record of its sale within the next 20 years. As far as its ongoing utilisation is concerned, during the period 1848-56 the premises were used as an ‘auction house’ – from 1857 until 1860+ either a boarding house or a private hotel – and during 1866 a private residence. On the 17th January, 1867 the very ‘plush’ household furniture and effects of 85, Brunswick Street were auctioned on the premises; a footnote on the ‘auction notice’ states: – “The House To Be Let [Unfurnished], or Sold – Apply To The Auctioneers”. Acknowledgements: Please refer to the complete history of the Castle Brewery for a listing of acknowledgements and research sources.